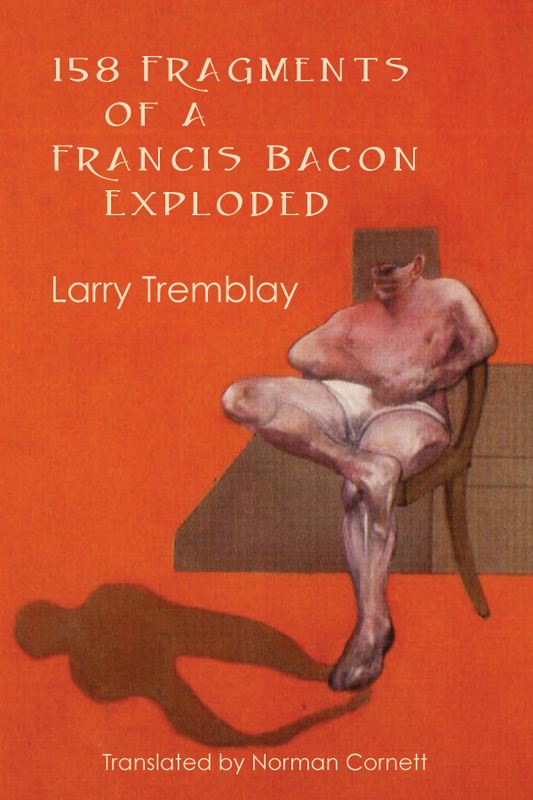 ﻿﻿﻿Concise and incisive, Larry Tremblay’s poems create a tessera of Bacon’s troubled universe, revealing the artist’s relationship to light and time. Tremblay has cultivated a special fascination for Francis Bacon’s paintings: its theatre of bodies, the physicality of the soul and its metamorphosis into flesh. To be able to write such a book on the works of a painter, the poet explores each of his paintings. The paintings surrender new meanings in fragments and succinct discoveries. The reader is witnessing a dialogue between Bacon (whose pain is continuously recapitulated) and Tremblay’s poetry (whose body is emptied as the poet immerses deeper into the folds of the painting). Throughout the years a special painting, in fractured nuance and hesitant context, developed in the spirit of the poet attracted by the questions Bacon’s work that keeps on kindling. Larry Tremblay is a writer, director, actor and specialist in Kathakali, an elaborate dance theatre form which he has studied on numerous trips to India. He has published more than twenty books as a playwright, poet, novelist and essayist, and he is one of Quebec’s most-produced and translated playwrights (his plays have been translated into twelve languages). His novel, The Bicycle Eater, published by Leméac, was unanimously praised by the critics, and won the Prix Roman 2003 at the Salon du Livre in Saguenay-Lac-Saint-Jean and was a finalist for the Governor General’s Award. In 2006 he was awarded the Canada Council Victor Martyn Lynch-Staunton Award for his contribution to the theatre. He was a finalist in 2008 and 2011 for the Siminovitch Prize. One of Quebec’s most versatile writers, Tremblay currently teaches acting at l’École supérieure de théâtre de l’Université du Québec à Montréal. Professor Norman Cornett has published in numerous Canadian and American magazines as well as being a guest professor in many North American and European universities. Professor Cornett’s translations have been featured in reference literary journals such as Canadian Literature, Windsor Review, Rampike, Literary Review of Canada, FreeFall and ARC. He is the main translator of Naim Kattan’s novel Farida.